Join us for our 2019 Men's Conference on March 2nd, 2019! 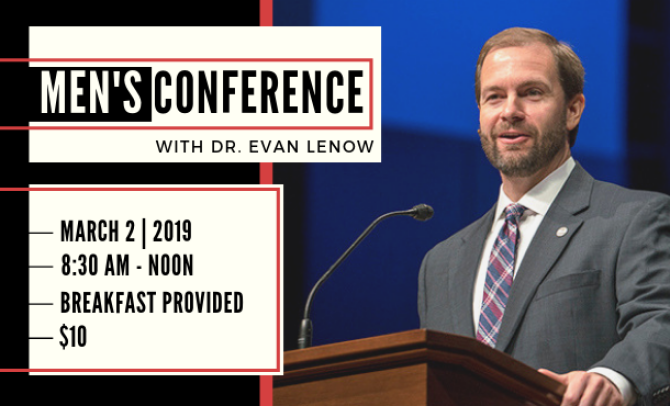 Our speaker for this conference is Dr. Evan Lenow. Dr. Lenow is Associate Professor of Ethics at Southwestern Baptist Theological Seminary. He also serves as Director of the Richard Land Center for Cultural Engagement and Director of the Center for Biblical Stewardship at Southwestern. Dr. Lenow is also a Research Fellow in Christian Ethics for the Ethics and Religious Liberty Commission of the Southern Baptist Convention. Dr. Lenow uses his interest and background in ethics to serve the community as well. He served for six years on the Fort Worth Ethics Review Commission, a City Council-appointed committee that hears cases of ethics violations by city employees. He currently serves as president of the school board for Christian Life Preparatory School. He has also been interviewed by local television and radio media in the Dallas-Fort Worth Metroplex regarding ethical issues related to marriage, family, and sexuality. Dr. Lenow will be speaking on the biblical vision of manhood, biblical manhood in the home, and biblical manhood in the workplace. The cost for the conference is $10. Breakfast will be provided at 8:30 AM.